Our 4 in 1 Water Slide Sports Combo is an awesome Combo giving you a large jumping surface with plenty of screens for parents to keep an eye on there children. after you get tired of jumping climb up the large slide and climb to the top take a quick look around and wheeee all the way down and SPLASH in the water at the bottom. 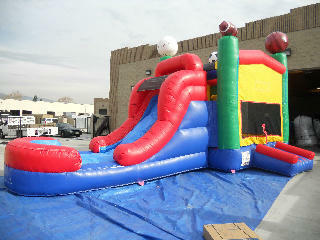 We have a very limited number of Bounce Houses with Water Slides so book early to make sure you get one for your special event on those hot Summer Days.